The Scottish Government’s approach has been credited by the Organisation for Economic Co-Operation and Development (OECD) as the most developed outcomes-based approach by any government in the world. 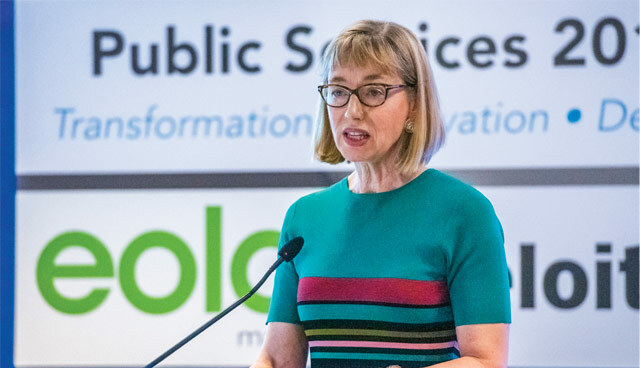 Permanent Secretary to the Scottish Government, Leslie Evans, discusses how this was achieved through the country’s National Performance Framework and how it has brought power and decision making back to the community. Evans states that Scotland, and the rest of the world, is facing a future that can only be described as VUCA – “volatile, uncertain, complex and ambiguous”. It is for that reason that she has been “leading a programme of organisational change to make our organisation more open, more capable and more responsive”. Constitutional change “dominates the recent and current Scottish context”, Evans says: “Our Scottish Parliament was established in 1999 and has been led for the majority of its time by coalition and minority governments. We’ve seen a referendum on Scottish independence, with a turnout of 84 per cent, and an unprecedented level of engagement by young people. As well as turnout of 81 per cent by those least likely to vote. “We’ve seen changes at Westminster, not least the Brexit vote, which played out very differently in Scotland. Scotland shares other VUCA conditions with Ireland and other countries: we’ve been through the economic crisis of 2008 and the fragile recovery,” she outlines. That fragile recovery has widened socioeconomic chasms and created the largest geopolitical shifts in a generation, of which Brexit is but one symptom. Evans is cognisant of such continued and deeply-entrenched inequalities, as she points out: “It’s worth remembering that for some people, life has always been VUCA. The legislative guide for the work undertaken to find these answers is the Scottish Government’s National Performance Framework (NPF), first introduced by the Scottish National Party led minority government in 2007. Evans says that 2007’s government came to power “very keen to establish strong, competent government and they introduced the first NPF with a focus on long-term, joined-up outcomes”, which “allowed us as civil servants to chart progress in a range of social, environmental and economic indicators”. A second guide for the overhaul of Scottish public services was the Christie Commission report, chaired by the late former Scottish Trade Union Congress Chairman Campbell Christie, which described the prize for reform as a sustainable person-centred system achieving outcomes for every community, which would require a complete transformation of Scottish public services. “Eight years on, the term Christie is part of our common parlance in Scottish public services,” Evans smiles. Changing times and generations require technological change too: “Our public services need to work in different ways in different places to understand and meet the needs of different communities. Young people have very different expectations for public services, there is no nostalgia there for the founding of the NHS, just frustration that you can’t register online with a GP. Supplying those best-placed to affect change is a constant theme of Evans’ vision of governance, she is also keen to praise the Community Empowerment Act, which aims to have 1 per cent of all local council budgets decided within the communities by 2021. “We must work with and through others, including our communities and make the most of our talent by empowering our teams,” she says. It is a public service reacting to Scotland’s changing makeup too: the Scottish Parliament has set a statutory objective for women to make up 50 per cent of public service board members by 2022, and Evans points out that both the Cabinet and her senior management team are gender equal. Scotland’s minority ethnic population is around 4 per cent, with over 3 per cent of senior civil servants declaring as minority ethnic.